You want to build a durable community in your city mobilized around climate issues and negotiations but you are still wondering how to make genuine changes happen? This can be achieved by using innovative pedagogical tools called “simulations”. Simulations are at the core of the COP in MyCity project and you are going to discover why. It consists in a role-playing event in which you will mimic the structure of an international negotiation conference following all its procedures. Participants are supposed to play the role of the actors represented “as in reality” and respect as accurately as possible the protocol of the UN. Success stories: They did it! In June 2011, the first simulation called COP-RW was born at the initiative of IDDRI researchers (Institute for Sustainable Development and International Relations) to "replay" the negotiations of the COP15 in Copenhagen. 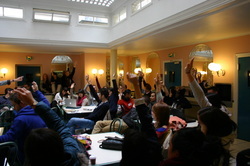 After three days of intense debate, the 150 participants of Sciences Po Paris were strongly affected by the experience and understood the difficulty of international negotiations and intercultural dialogue. It even prompted several of them to go further and create the student organization CliMates! The MyCity +20 team invented the concept of “simul-action”, which consists on a simulation combined with mobilization, awareness raising and debriefing phases. This format allows participants to use the experience as a lever for innovative actions and sustained mobilization from young people. To help you in the making of an innovative simulation, COP in MyCity recommends using the practical approach developed by Climate Interactive. C-ROADS-CP simulation gives fast and reliable calculations of the long-term climate implications of international climate change proposals. Contact us at copinmycity@climates.fr to receive our Simulation Toolkit and know more about how to organize the C-ROADS-CP simulation. Get concrete outcomes: It’s just SO worth it! Remaining involved in the promotion of the Sustainable Development through different ways (individual change of behaviour, individual sensitization, involvement in NGOs…). Convinced? Discover the COP in MyCity project and organize your own simulation!